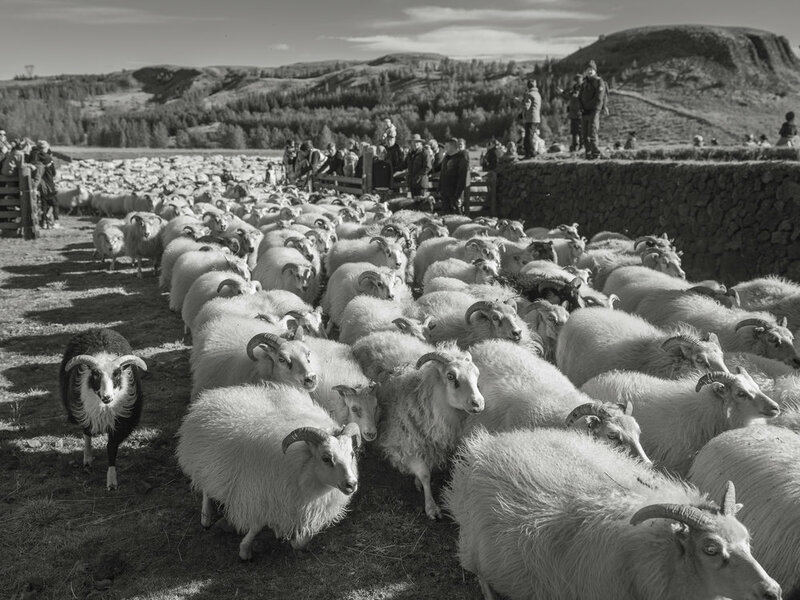 A herd of sheep running into the réttir site to be sorted by the farmers. Sometime after my first trip to Iceland in the summer of 2017, I developed an interest in a cultural event that happens regionally around the country in September, known as the réttir. As we drove around the island, I noticed the ringed pens that looked like wheels with spokes and after an inquiry about their use, was told they were sorting pens to separate sheep after the fall roundup. Of course sheep in Iceland are prevalent. In fact they are everywhere from open pastures, up in the highlands, on hillsides above waterfalls, to grazing along the ring road.